Key ships stationed over BP's crippled well in the Gulf of Mexico were ordered to evacuate Thursday ahead of Tropical Storm Bonnie, and engineers have grown so confident in the leaky cap fixed to the well head that they will leave it closed while they are gone. Tropical Storm Bonnie, which blossomed over the Bahamas and was to enter the Gulf of Mexico by the weekend, could delay by another 12 days the push to plug the broken well for good using mud and cement, retired Coast Guard Adm. Thad Allen and BP officials conceded. Even if it's not a direct hit, the rough weather will push back efforts to kill the well by at least a week. "While this is not a hurricane, it's a storm that will have probably some significant impacts, we're taking appropriate cautions," Allen said in Mobile, Ala. The cap has been in place for a week with pressure rising, CBS News Correspondent Kelly Cobiella reports from Port Fourchon, La. Cameras on remotely operated vehicles - unmanned submarines - have spotted no major leaks or signs it's unstable. BP executive Doug Suttles said engineers may have some data on the well but not until after the threat passes, Cobiella reports. It was unclear Thursday night whether some of the vessels would go back to port or head further south in the Gulf out of the path of the storm and await orders once the storm passes. 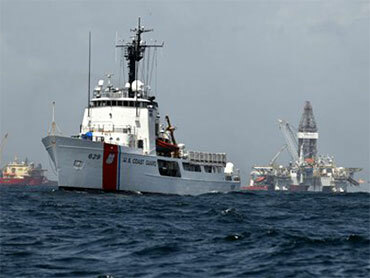 The Coast Guard cutter Decisive, the hurricane guard for the vessels at the spill site, was awaiting instructions. In an evacuation, the Decisive is the last vessel to leave the area. Seas already were choppy in the Gulf, with waves up to five feet rocking boats as crews prepared to leave, and more of the smaller boats involved in the coastal cleanup were called into port, Coast Guard Rear Adm. Paul Zukunft said. Louisiana Gov. Bobby Jindal said he expects local leaders in coastal parishes to call for evacuation of low-lying areas as early as Friday morning. At the spill site, the water no longer looks thick with gooey tar. But the oil is still there beneath the surface, staining the hull of cutters motoring around in it. One large vessel - the Helix Q4000 - is burning off oil collected from the water, and bright orange flames flared at the side of the ship. Scientists say even a severe storm shouldn't affect the well cap, nearly a mile beneath the ocean surface 40 miles from the Louisiana coast. "Assuming all lines are disconnected from the surface, there should be no effect on the well head by a passing surface storm," said Paul Bommer, professor of petroleum engineering at University of Texas at Austin. Charles Harwell, a BP contractor monitoring the cap, was also confident. "That cap was specially made, it's on tight, we've been looking at the progress and it's all good," he said after his ship returned to Port Fourchon, La. Before the cap was attached and closed a week ago, the broken well spewed 94 million to 184 million gallons into the Gulf after the BP-leased Deepwater Horizon rig exploded April 20, killing 11 workers. Work on plugging the well came to a standstill Wednesday, just days before authorities had hoped to complete the relief shaft. Allen said Thursday he has told BP to go ahead preparing for a second measure called a static kill that would pump mud and cement into the well from the top, a move he said would increase the relief well's chances for success. BP will have to get final approval from Allen before starting the procedure. Vice President Joe Biden visited cleanup workers in southern Alabama, and said he was cheered the cap could remain on. "After the storm's passage we will be right back out there," Biden said.